Home » Past Screenings » MOLLY'S GAME Advance Screening Passes! MOLLY'S GAME Advance Screening Passes! Do you want to see MOLLY'S GAME before anyone else? Learn how you can see an Advance Screening to see it before anyone else. 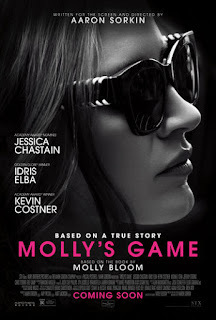 MOLLY'S GAME is based on the true story of Molly Bloom, an Olympic-class skier who ran the world's most exclusive high-stakes poker game for a decade before being arrested in the middle of the night by 17 FBI agents wielding automatic weapons. Her players included Hollywood royalty, sports stars, business titans and finally, unbeknownst to her, the Russian mob. Her only ally was her criminal defense lawyer Charlie Jaffey, who learned that there was much more to Molly than the tabloids led us to believe. Comment below so we know what cities to add. NO PURCHASE NECESSARY. Passes available on a first-claim first-serve basis. You will need to register for a free STX Tickets account in order to redeem the passes and each registered user account is limited to claim one admit-two pass. SEATING IS LIMITED, SO ARRIVE EARLY. PASS DOES NOT GUARANTEE A SEAT AT THE SCREENING. Refer to screening pass for further restrictions.